Request Colors, Sizes or other changes right here! 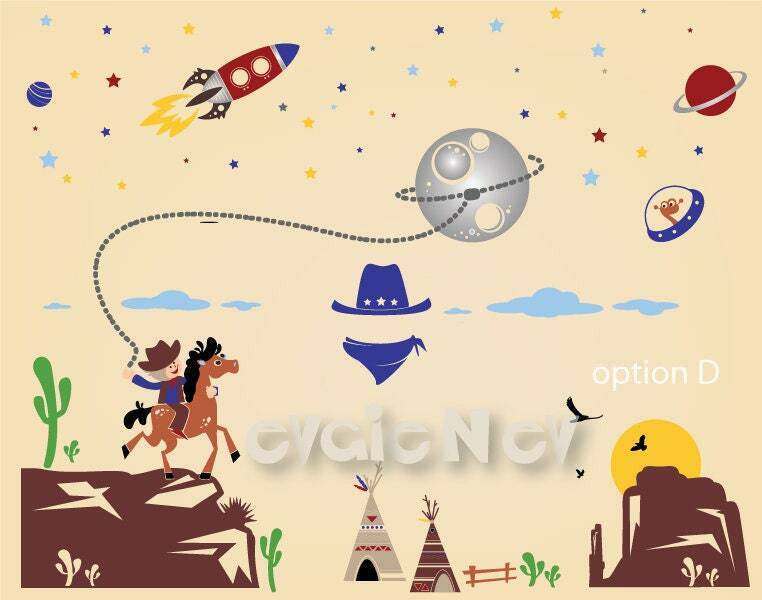 Aliens and Cowboys, this exclusive Wall Decals Set themes designed to introduce and mix fantasy with reality. It engenders fascinating feeling of joy, adventure and play while motivating you little children to develop empathy and curiosity. Who are those Cowboys of another universes where Aliens are racing through the sky? How come they are crossing with each other in a such recognizable earth-like landscapes? Those elements are so familiar and unusual at once while imagination keep developing and creating world of tales and journeys. Dimensions: w 131" x h 90"
you will receive the default item displayed in the first picture. With every order you get 3 FREE CUTE MINIATURE COPIES of our decals, your choice of monkeys, elephants or dogs or combination. You may put it on mirrors, glasses, your laptop or just hand it to your friends and relatives as it makes a great small gift. • Our vinyl decals are made from high quality matte (made in Germany) vinyl which looks like painted on the wall. It is removable, so it's simple to transform any room over and over again. Just peel and stick, it's so easy! Will apply to most smooth surfaces. It's also removable and won't damage walls! • We can offer FREE test decal for you to practice on and EASY Step-by-step detailed instructions! • We can adjust the decal size larger or smaller and add additional colors. Contact us for pricing! • We also can do custom design requests. If you have an idea in mind of a custom design, contact us! Looking for something different but haven't found it yet? Having your own idea in mind and craving to see it on your wall? Drop us a line with your questions, feedback, or just to say hello. 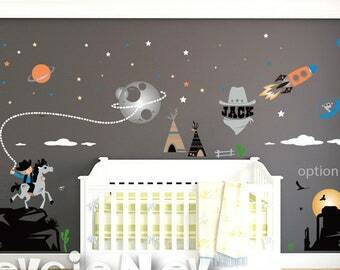 Outer Space Wall Decals, Boys Wall Decals - Wall Decals Nursery for Boys - PLOS010R - CHECK OUR SUMMER Deals!!! Love it, thank you so much! We love our twins nursery!!! Better than expected as far as quality and ease of use. We love the decals! Very cute and easy to put up. We ordered the wrong set, but Evgie made it easy to return. Highly recommend! It is such a cute and easy way to transform a room temporarily...which is great for a rental property. Please be aware that we do NOT allow to combine coupons and/or promotion discounts that we run time from time. If you are not happy with item or change your mind we would accept the item back with full refund or exchange in case if decal is usable and can be resold. Only shipping charges are NOT refundable and please be aware item needs to be shipped back during 2 weeks upon receiving. Once we have it in hands and review we will do refund. We ship WORLDWIDE through and charge shipping fee $14-18 for USA and Canada.